South Africa need a miracle to save the second test match against Sri Lanka. The visitors are chasing target of mammoth 490 runs. 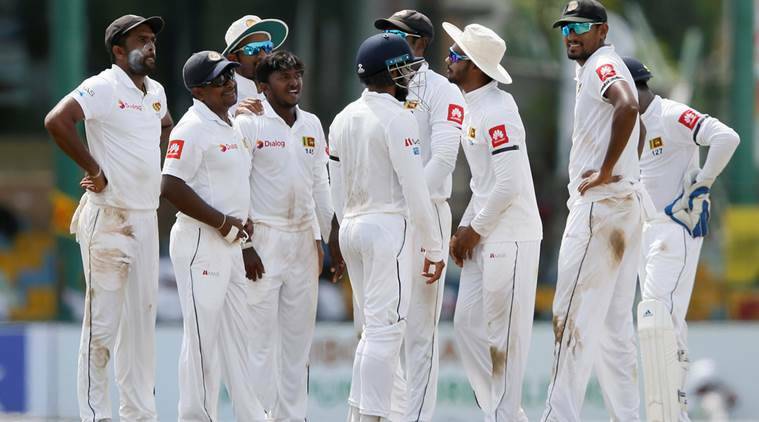 At the start of the day, Sri Lanka were already in a dominating position. Their overnight score was 151 for 3. South Africa got all out for 27 less runs than Sri Lanka's second innings overnight score.But they were made to toil hard,were the proteas.Day 3 started with Maharaj and Rabada bowling in tandem. Neither of Karunaratne or Mathews seemed to struggled. They scored at quite a good pace. The lead was already in excess of 400.In came Lungi Ngidi. First ball of the over after the bowling change and he found the edge of Karunaratne. The batsman departed for a well made 85. But Sri Lanka at that time were in commanding position. Roshen Silva and Mathews started to build a partnership.Mathews brought up his half century.He got there in a space of 86 balls. Eventually Lunch was taken.The shoulders from South African camp had already started to fall by then. The visitors might have hoped that Sri Lanka declare. Such was the misery.After Lunch, Sri Lanka started cautiously. There were no rash shots played. But once again it was that man, Keshav Maharaj who got rid of Mathews.The batsmen egded one to Faf du Plessis at slip.He departed for a well composed 71.Dickwella came in who has got this impression of scoring quick. But he batted for only 7 balls as Sri Lanka felt the lead was good enough. The target set by the hosts was 490. In came the openers.Similar to the first innings Sri Lanka started off with spin from both ends.However it took them 8 overs to get their first wicket. Markram trying to sweep Herath was found plumb.It was de Bruyn next.They didn't loose any other wicket and at tea but they still needed 448 more runs to win. Post tea,de Bruyn seemed to be in good touch.He was scoring with both good intent and pace.Elgar didn't find it going although at the other end.As a result he was pinned right in front by a cutter from Dilruwan perera.Amla continued his poor form as he was out bowled by an absolute peach from Herath. du Plessis the best batsman for South Africa on this tour walked in. Dananjaya Silva was bowling well. First he got du Plessis courtesy an excellent review from Lakmal and then on the very next ball he scalped for Keshav Maharaj who was sent in as night-watchman. Five overs thereafter, South Africa at the end of the day didn't loose a wicket.The scoreboard read 139 for 5. Meaning they still require 351 runs with only 5 wickets in hand. An excellent series win awaits for Sri Lanka awaits when they come out tomorrow.Until then stay tuned.